This fun and decadent chocolate cake will be the star of any holiday meal this year. 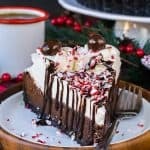 This Chocolate Peppermint Cheesecake Cake is actually easier than it looks, but don’t tell your friends that. Let them think you are a kitchen diva and know how to rock your baking pans. One of my favorite things about the holiday season are all the holiday shows on TV. I remember as a kid watching all the Christmas cartoons every single year. We would sit and watch Frosty, Rudolph, and The Grinch every single year, even when I was a teenager. When our kids were younger, we would do the same thing with them. As they have gotten older, they kind of look at us funny when we turn these cartoons on. Where has the magic of childhood gone? I think it died out when hand held devices became the rage. Time to institute the no gaming devices again, and plan a fun family movie night. Cake included! I am SO excited to be partnering up with The Dating Divas today for a fun holiday date night! I’m sure you’ve all heard of The Dating Divas, right? If not, you are missing out! 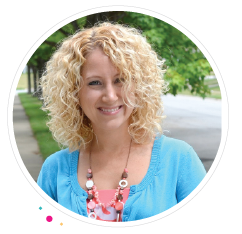 They’re a group of married women who post fun, creative, and inexpensive ideas that will put the SPARK back into your marriage. If you’d love to reclaim the romance and excitement you had back when you were first dating, then this is the site for you! And today, I’ve teamed up with the Divas to bring you a special treat… Dinner Dessert and a Movie!! Because who doesn’t love a fun date with a good movie and a delicious dessert? That’s right, I’m going to hook you up with a fabulous cake idea for eating while watching The Grinch, and the Divas are taking care of all the date details for you. Read on, because you’ve got one spectacular (already planned) date night coming your way. Think green. Dinner and a stay at home movie is definitely a fun thing my husband and I enjoy. After having kids and realizing that going out to the movies was so expensive, we started having our own at home dates when the kids would go to bed. No obnoxious movie goers to deal with, pausing when you need a bathroom or snack break, and snuggling close on the couch are all major reasons we like to stay home. That and it is so much better for our wallets. 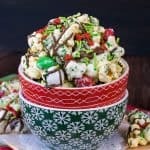 When I heard that December’s movie night was The Grinch I started thinking about creating all sorts of fun green desserts. But in the end I opted for a crazy and fun colored cake. One of my favorite scenes in the movie is when they show all the food at the Whoville dinners. I knew that a crazy cake with lots of colors would be the perfect dessert to enjoy after watching the movie. This cake looks super impressive, but it is actually really easy to do. 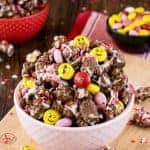 It starts with a box mix that you will jazz up to make super decadent. is to keep the cheesecake away from the edges of the pan. This is probably the hardest part of the cake..and it really wasn’t that hard. Spoon half the batter into the prepared pan, then start to spoon the cheesecake into the center of the cake. Now naturally the cheesecake will start to spread and head toward the edges of the pan. Just spoon small spoonfuls of chocolate batter along the edges of the pan to keep it from running. Once all the cheesecake batter has been added, then spoon the rest of the chocolate batter along the edges of the pan first and then over the top of the cheesecake to seal it in. at Walmart and just had to bring them home with me. A lollipop stick wrapped in washi tape and some extra chocolate and sprinkles make them the perfect over the top decoration for your cake. Are you ready to get your green? 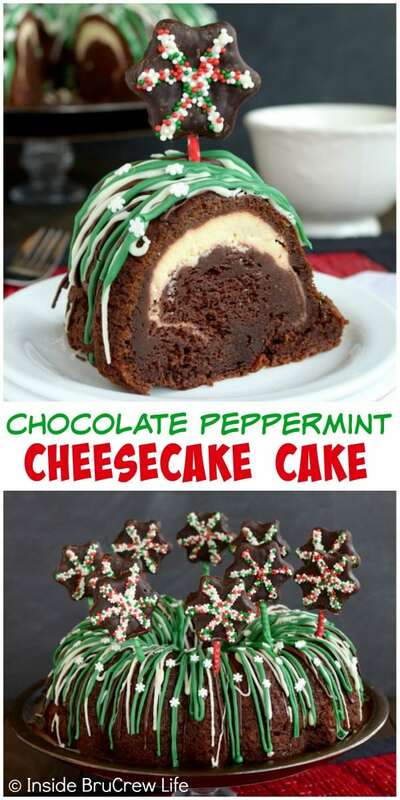 Grab your hubby, a slice of of chocolate peppermint cheesecake cake, and let’s watch The Grinch again. 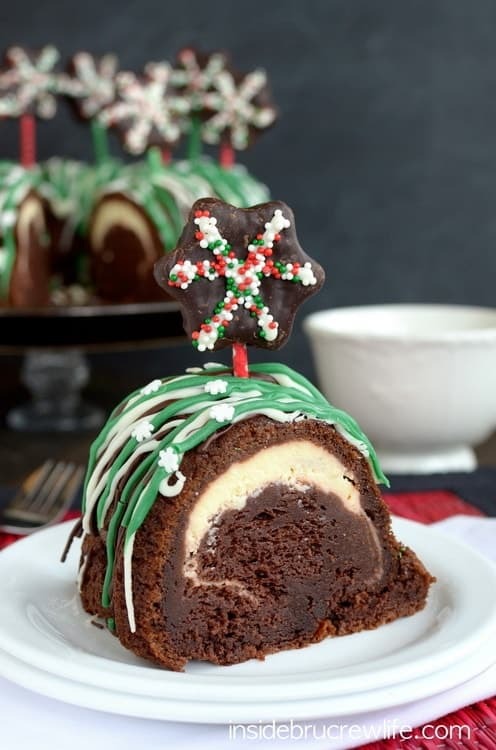 This rich chocolate cake has a hidden tunnel of peppermint cheesecake. 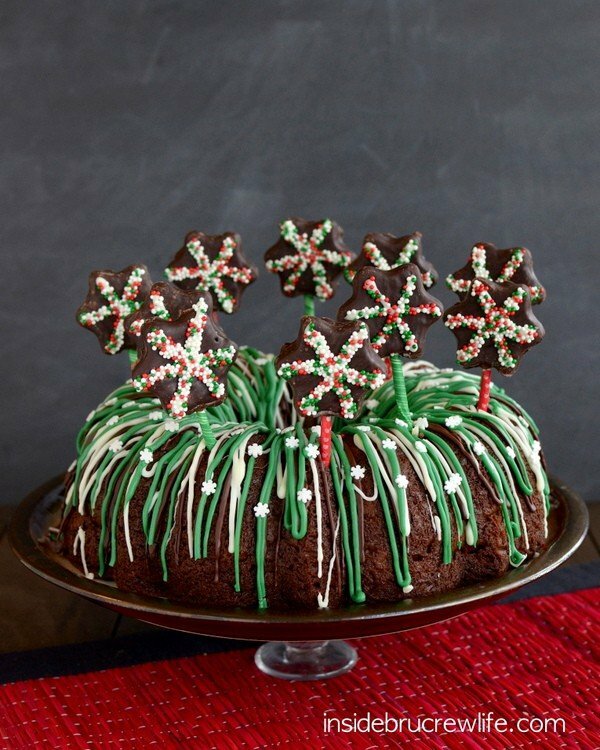 The decorated peppermint patties on top add a fun party look. Preheat the oven to 350 degrees. Spray a bundt pan with nonstick spray. Beat the cream cheese, sugar, egg, and peppermint extract until creamy. Set aside. In a large mixing bowl, combine the cake mix, pudding mix, sour cream, eggs, oil, and water. Beat for 1 minute on low, and then two minutes on medium. The batter will be thick. Spoon half the batter into prepared pan. Spoon the cheesecake batter over the batter in the pan. Be very careful to not let the cheesecake batter to touch the sides of the pan. If it starts to get close, add a spoonful of chocolate batter along the side of the pan to act as a barrier. After the cheesecake batter has been added, gently spoon the rest of the chocolate batter over the top. It works best to spoon the chocolate batter along the pan edges first, then over the top of the cheesecake. Bake for 50-55 minutes. Let cool in the pan for 10-15 minutes, then flip out onto a serving plate. Let cool completely. Place the chocolate chips and 1/2 teaspoon shortening in a microwave safe bowl. Heat for 30 seconds. Stir. Repeat for 15 seconds. Stir until melted. Dip the ends of the lollipop sticks into the chocolate. Gently press into the peppermint patties and place on a tray. Spoon the chocolate into a plastic bag with one tip cut off. Drizzle over the top of the cooled cake. Melt the white chips the same way and spoon into a clean bag. Very carefully line your peppermint patties with a snowflake shape and top with sprinkles. Set aside. Drizzle the cake with the rest of the melted white chocolate. Melt the green candy melts the same way and spoon into another clean bag. Drizzle the top of the cake. Top with sprinkles. Let set. Keep refrigerated until serving. Right before serving place the decorated peppermint patties into the top of the cake. You may need to cut the ends to make them different lengths, and you can also wrap the lollipop sticks in washi tape before sticking them in the cake if desired. Now head on over to The Dating Divas for your fun Grinch date night. They have the whole night planned out with fun green things to do. *Affiliate links have been added. Thank you for your support and letting me share brands and products we love. Thank you Julie! I hope you do give it a try! Oh my gosh Jocelyn, that peppermint cheesecake ribbon running through the center of the cake is sending my sweet teeth into over drive. This is a fun , fun cake!! Pinned!! I saw this cake and just smiled! You really did a fabulous job on this one Jocelyn! Love the colors and decorations on the outside and the cheesecake layer on the inside. Perfect!! Wow! This looks absolutely decadent! Mmmm. Love it, Jocelyn! I wish I could taste test this through the computer. Yum! So festive too. I love it! How pretty is this cake?! 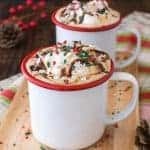 I love it — it’s so fun and festive, and I know it has to taste even better than it looks! I love the idea of a Who dinner! That would be so much fun!!! Sounds like so much fun. The Grinch is my favorite holiday movie. This cake looks like the perfect holiday treat. Pinned. It just isn’t the holidays until we watch The Grinch 🙂 thank you for the pin love! I love recipes that look complicated but are actually easy. I’m currently loving Home Alone and ELF this holiday season. It’s nice to just cuddle up on the couch next to the tree and watch all these festive movies. I agree on loving recipes that are so easy but give that WOW factor! We love to do movie nights, especially with Christmas movies. This cake is simply gorgeous! I LOVE all the holiday shows and movies!! Honestly, they are my favorite!! This cake is gorgeous, fun and SO festive!! You amaze me with you creativity! This looks so incredible!!!! I need a big slice right about NOW! What a pretty cake Jocelyn! 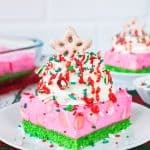 This is perfect for the Whoville dinner table 🙂 Pinned, I love how fun and festive this cake is and the cheesecake filling looks incredible! I really really really like those peppermint patty toppers! So fun! And that tunnel of peppermint cheesecake looks amazing. This whole cake looks fudgy and chocolate-y and beyond incredible. Pinning this one for sure! This is so neat and creative! Love love love! Josh and I just watched The Family Man on Saturday…one of my favorite holiday movies, but I love watching Home Alone with the kids. What a fun, festive cake! Love the peppermint patty toppers you created! Thank you Jessica! It was a fun one to work on! Oh my! I can’t handle this cake right now! 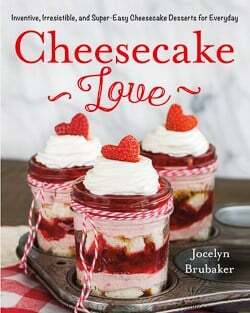 I love everything about it – from the cheesecake to the festive drizzled frosting, to the peppermint patties! So wonderful! I totally agree with…on the taste and the atmosphere! Plus it’s so much more fun! 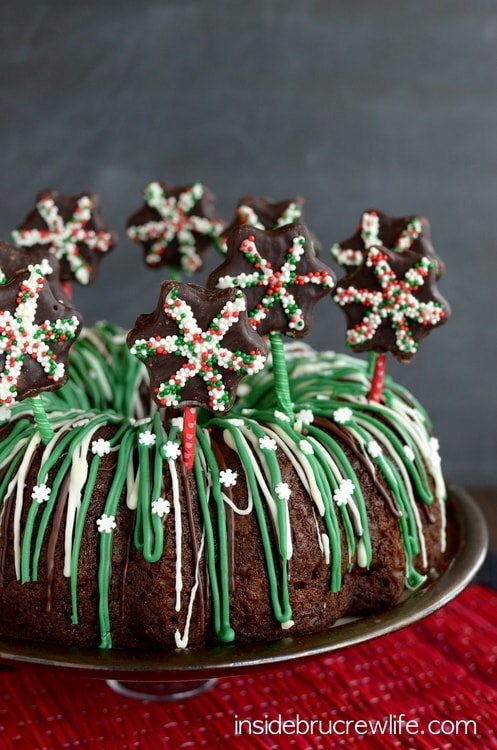 This looks amazing, festive and just plain yummy! Thanks for sharing the recipe. Holy Cow this looks and sounds awesome! I am pinning this to my “Recipes to Try” and my “Seasons: Winter” Pinterest boards! Thank you so much for the pin love Stephanie!!! What a beautiful festive dessert! 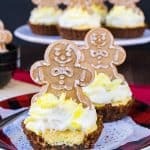 I love this time of year and all of its desserts! what a fun cake! 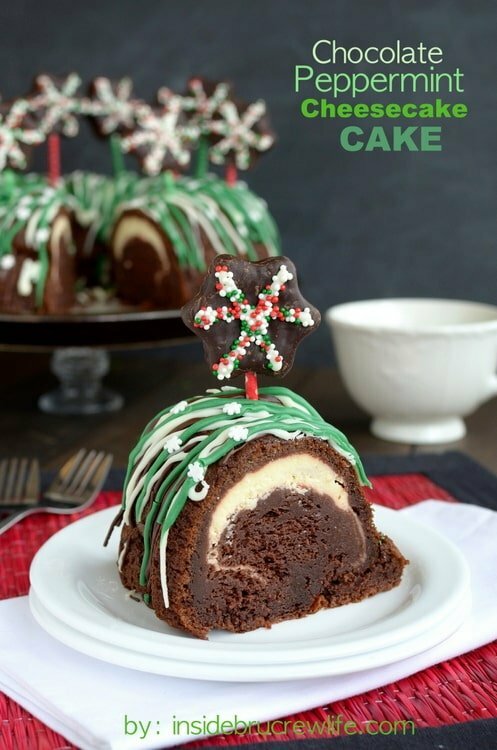 I love these type of bundt cakes, all decked out for the holidays! So there is hope that they will love these movies when they get older? I can live with that! The idea of that hidden ribbon of cheesecake is beckoning me! 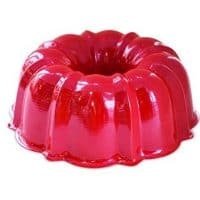 I love this bundt cake!! And those peppermint patty pinwheel picks are adorable. it looks festive and yummy! This cake is gorgeous! Yum! Wow, Jocelyn, that looks incredible!! I’d like to make this cake this week for Xmas Day. Can I freeze it with the drizzled chocolate on top then add pops when thawed day of? Thx! I have never tried to freeze this cake, but I think it should be fine. I would wait to add all the chocolate until after you thaw it out though. What a gorgeous holiday cake! I still love the Christmas cartoons too! I’m a big fan of movie nights at home too! This cake looks gorgeous and sounds amazing! !